I used to read about women who had a range of clothes in their closet for the different weights they were at. I’d never quite understood that because my weight was fairly consistent. I mean, I would go up in size, but didn’t yo-yo. Right now, I am definitely in a place where 50 percent of my wardrobe doesn’t fit me. I don’t love it. But, I don’t hate myself for it either. That said, this left me with a bit of dilemma this sewing weekend. I started on a 2007 Burda pattern that I’m making up for a ‘picnic wedding’ in upstate New York at the end of the month. Now, the old me sewed a 38 with a 1/2 inch FBA. Umm, no. The current me, after FOUR muslins, seems to need a 40 with a 1.25 inch FBA. Heavens. Above is the 40 with a .75 inch fba (and the darts lowered and angled differently). I went ahead and added another .5 inch to my pattern because of pulling side seam *only* at the bust and some drag lines at the waist pointing to my bust apex. I didn’t muslin that one. So, let’s hope I don’t have saggy bodice when I’m done! I’d rather have a dress that fits right ‘now’ than feel uncomfortable in something that’s just too snug and hopeful it will fit later. 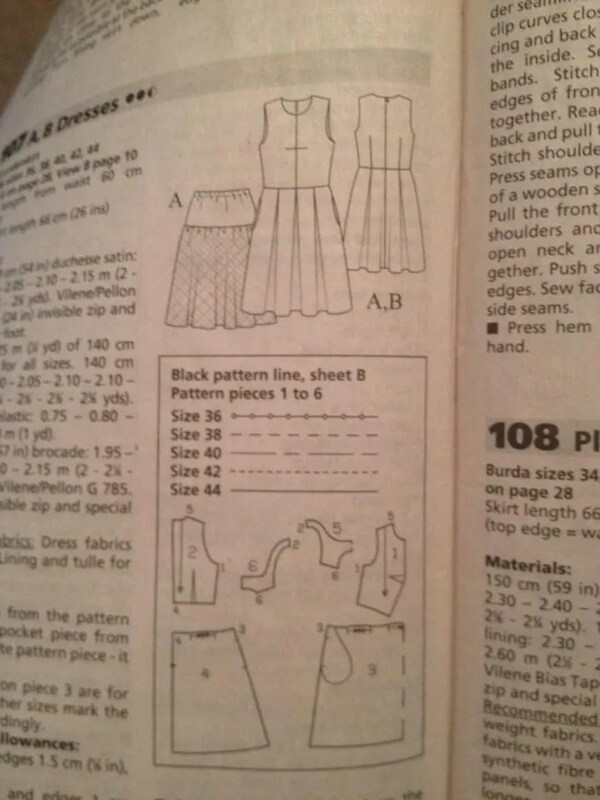 So, which body do you sew for? The one you have now? Or the one you kind of want to have back? Other weekend notes. Black Tie wedding was this weekend. 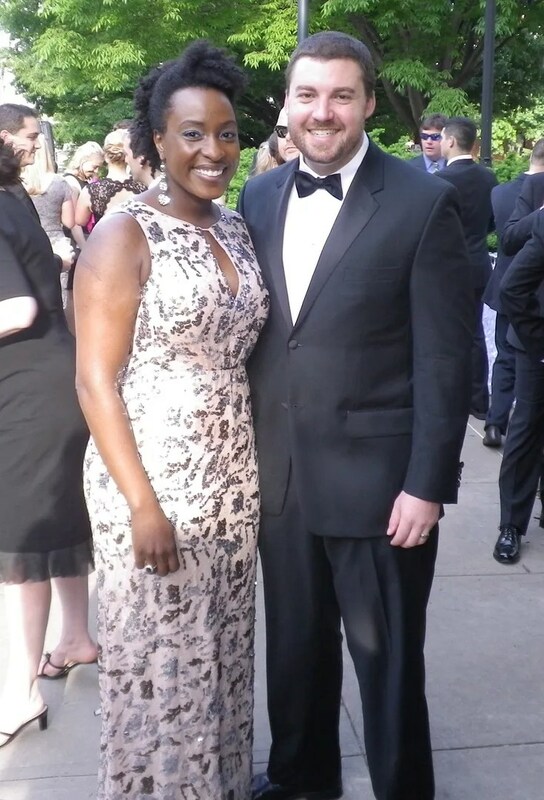 This was the second of two black tie events that prompted J. to just buy a tuxedo instead of renting one twice. I’m still wearing a RTW dress. After these last two formal outings. I don’t know that I’m going to ‘bother’ sewing a formal dress again. I’ve made three formal dresses myself. And, the only home sewn formal dress I’ve come close to getting the same number of compliments as I do in RTW is this silver one. And, I put in a TON OF TIME for a dress that I only wore once. I hope to wear my two formals at least two more times. But, for the level of effort vs amount of wear, I’m going to have to go with the under $200 formal on sale rather then making one. And, I’ll be honest, my RTW formalwear has details and fabric that I can’t do nor afford. 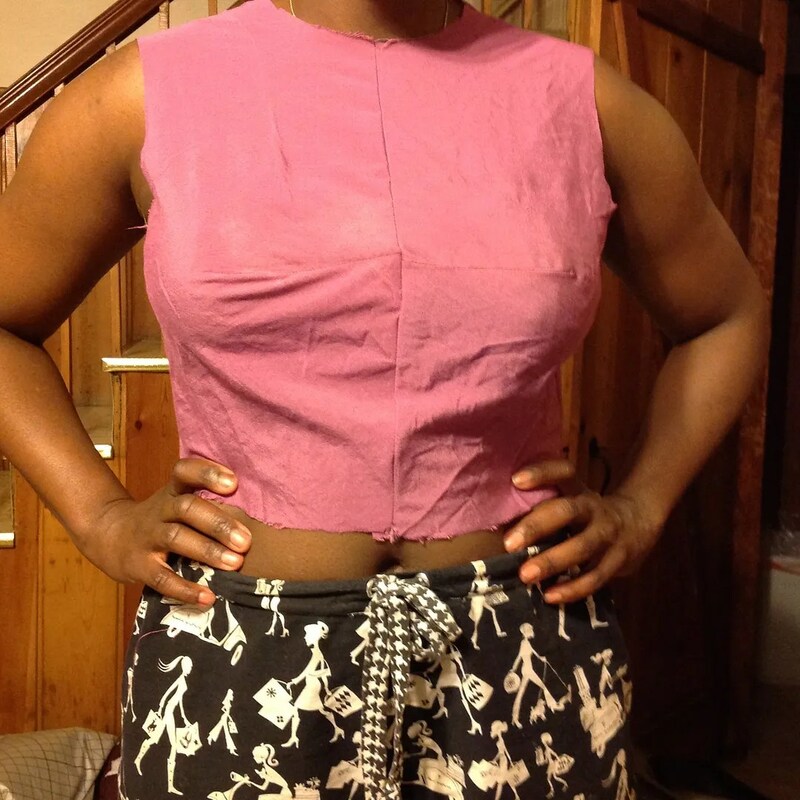 And, because I CAN sew, it’s easy for me to make simple alterations to have a custom look. Maybe this will change later on in life. But, for now, it’s not worth it to me to sew these kinds of clothes anymore. What about you? Do you always sew your formals or do buy them? Previous Post Never Say Never. Dress Into a Skirt. Hi! I’ve been lurking on your blog for a little but wanted to pipe up on your second issue: I’m trying to make my own wedding dress now. It is a pain, but wedding dresses are so massively overpriced that even simple shifts are $700 for something made from polyester. Irritating! But this is really the only time where I think the cost/benefit analysis is overwhelmingly in favor of sewing your own formalwear. So long as you’re not after floor length and white, I think you’re right about going for rtw for one-time wears. You are correct. And, they don’t really go on ‘sale’. And, never mind if you throw any trim on it! I like my dress, but it’s got so much plastic it would melt in a fire. Oh, I agree. I didn’t make my wedding dress (it was just a lacy cocktail dress I got for $100 on Ebay and altered to fit) and have had much more success with purchased formal wear… I’ve made one serious formal lined dress and that was over 10 years ago. Not worth it for me the few number of times I can wear it, and I’ve had a lot of success finding beautiful formal dresses on deep sale or at secondhand shops. I made my wedding dress as if it were a stage costume — which, in a way, it was. Only one wearing, for a few hours, meant that I cared not one fig if it were of silk or of polyester. Have to pin the waist of the skirt shut because no time to make a buttonhole? It’s hidden under the peplum of the jacket, so who cares? Machine stitched instead of hand-sewn? The wedding is at night, the sanctuary lights are dimmed, no one will be able to tell. Don’t spend all your money on the wedding, save the bulk of it for the rest of your life together. Oh my goodness. Good luck with your dress! It’s a pain, but you are right it’s worth it in the end. I made my wedding dress (with help) and my best friend’s wedding dress (with no help and from 800 miles away). Worth it both times, total pain both times, and not something I will EVER do again! Although both dresses cost ~$200 vs. the $700+ that they wanted even at the discount stores. And I definitely won’t bother making formal wear for myself. If my hubby and I ever have a daughter, that would be a totally different story as I have some very fond memories of making formal attire with my mom when I was younger – and those were always fun bonding experiences. I am a beginning garment sewer, so I wouldn’t try to make a formal dress. But I totally agree with you, I have found tremendous bargains on formal dresses off season. For me the key is to buy a dress when I see it, not when I need it. I couldn’t buy the fabric for the price I’ve paid for a few of those dresses. Renee, I like the dart placement on that bodice. Looks like you’ve nailed the fit. I carried around a lot of extra weight for a whole lot of years. I wasn’t happy about it either, but I’ve always been a firm believer is dressing for your size. Walking into a closet full of clothes that fit you well *right now* makes your day start off better than walking into a closet full of clothes that you don’t feel good wearing. With regard to RTW dresses – I agree in most cases it’s just easier and cheaper to buy off the rack. Today I am finishing up a dress for my daughter, however, because she is the exception. So. damn. hard. to. fit! And you and hubby make a gorgeous couple. Foolish women buy and make for their dream size, but it’s delusional. It doesn’t make you lose weight, and it is very frustrating not to have something to wear that is comfortable and flattering! I can say that, as when I was young, I could be foolish in this regard. I think you are smart to dress for the body you have now. If and when it changes, you can adjust your wardrobe. By the way, you and Jordan look fabulous in the above photo! I wear “formal” dresses a lot, but I don’t bother with couture details. I sew a very simple TNT dress in a sumptuous fabric the same way I would sew a cotton quilting dress. Why not? It will get worn less than the cotton one…maybe twice, as you say. And I shop for bargain sumptuous fabrics, too. I tend to lean toward stretch wovens and stable knits, and always sew for my current size. Formal wear can be time consuming and costly to make. RTW clearance racks are best for once or twice wearings. I admire your tenacity in nailing that sloper–great job. No matter what your current size, you always look stunning. You and Jordan are such a handsome couple. Great point about buying RTW for fancy dresses. Definitely worth it. I sew for the current size AND I’m ruthless about getting prior sizes out of the closet. There’s no need to torture myself for what I am not. Your dress is amazing !!! First off, I’m glad you’re back sewing, and looking forward to seeing the finished dress. Your first question is one that’s very pertinent to me at the moment. I’m currently at the heaviest I’ve ever been and Me-Made-May is a struggle as I’m reminded of all the clothes I’ve made that don’t fit me at the moment. I’m currently trying to sew some things that fit me right now. I strongly believe it’s important to feel good whatever your size, but ironically I find that very hard to apply to myself. It’s also tricky to fit when one is a bit fleshier as the fleshy bits sort of get in the way – I don’t want to emphasise them by fitting around them too much, but equally don’t want to squish them so they bulge out elsewhere. As for the special occasion dresses, I really love making them because of the process, although it can get very stressful. If I’m tight for time, I will look for RTW, but whether I buy that or not depends very much on what I can find and how well it fits. Sadly I don’t get to go to many black-tie events lately so it’s not that much of a big deal! YES! What I noticed this time is I need much more room in the back than I have before. It’s just fleshier. And, I have a few bras cut and waiting to be sewn that I think I have to revisit entirely. You’re right in that you learn a lot in making special occasion clothing (in regards to tailoring, etc.). But, lately, I just don’t have the time! Definitely sew for the size you are now, I say, anyway. What I do is different. I haven’t gained weight, but I suspect it’s redistributed itself over the last couple years because waists are always a bit snug now. My solution, instead of retaking measurements and being honest about them, is to put 1″ SA on all side seams so I can let it out a bit. Sewing can be so helpful in accepting your unique body, but it’s not foolproof. Well…I used to have a lot more formal events to go to when my husband was active duty military, so I generally would check the sale rack in department stores for formalwear, and purchase whatever fit and looked good on me, usually for less than $50. I’m with you-it’s cheaper and easier to just purchase a formal dress than make it. As far as clothes that don’t fit-I generally get rid of them. However, I’m at a menopausal part of my life so everything is kinda redistributing on its own so stuff that used to fit might still fit, but not look very good. I’m not going to change BACK to the shape I was, so it really just needs to go. Life is too short to constantly feel guilty! Awww! My mom used to love to get dressed up for Officer’s ball events too. I’m trying to let go of clothes. I’ve purged a bunch of suits that I think I will just not get back in to. But, in my mind I’m worried I’ll regret it! I TOTALLY AGREE with the ‘body re-distribution’ 🙂 I am still 5’7″ tall and 130 lbs at age 57…. but the bust has DEFINITELY dropped, with gravity. I never had children to make the ‘girls’ droop 🙂 (I am a 34DD) and the WAIST is bigger. I have always been narrow hipped, that’s still the same. I SEW for a living 🙂 My customers PAY ME to make THEIR clothes fit perfectly 🙂 My clothes===WHATEVER…. I buy retail and alter to fit myself. Now and then I have TIME to make myself a simple top that takes 3-4 hours and DONE 🙂 I have all of the materials I need to make myself a GREAT jacket and I will get to it==SOMEDAY 🙂 I suggest….BUY RETAIL and FIT YOURSELF 🙂 You simply CANNOT compete with the LOW RETAIL COST when you purchase your own fabrics and notions and consider the MASSIVE AMOUNT OF LABOR…. I was just thinking how nice it would be to have a formal skirt that I can switch out sequined / lace tops with. Much more forgiving and versatile. I also think if you ever want sleeves, you definitely have to make your own! I’ve never found dress up garments with sleeves. I have decided not to bother sewing formal dresses any more.I rarely go for black tie events and when I do, I want to look stunning, and for now I don’t think my sewing skills can give me the kind of dresses I have in mind. Plus I love a good bargain. I doubt I have ever made something for a special occasion, I couldn’t take the stress! Your formal skirt & top idea sounds really good. My work environment is casual, but we do have some events that need some dressing up, usually right after a packed work day. So I finally made a pair of dressy-ish black wool trousers that look good with beaded/fancy tops. Life saver. You two are a beautiful couple! I LOVE your hair in that photo. Thank you for noticing!! I was attempting a faux hawk 🙂 I also don’t make tee shirts and other simple basics. I used to dream of making suits, but I think I’ve given up on that too. If I’d gotten to make my wedding dress, I think it would have been really simple. But, clearly, I like the bling! Hello Renae, I like the question you pose… Very appropriate. I think we all should free ourselves from the notion that because we sew, we should always make EVERYTHING. I used to feel like that. Everyone in my close circle, including my husband says how wonderful I sew, and that if I can sew as well as I do, then I shouldn’t have to shop RTW. The pressure was on for so many years, until I reached the point you are at, enjoy the journey. Sewing is now looked at, as with cooking, sometimes it calls for “made from scratch” and other times convenience. I like your dress and you and your husband are so cute! P.S. You look amazing and to answer your other question—I always do try and sew for the size I am now, even if that size makes me a little grumpy. I’m thinking at the moment that maybe I should get rid of some of the slimmer clothes that I haven’t fit into in two years to stop feeling bad whenever I see them in my closet. Sigh… I won’t lie. I buy most of my formal. I like sewing formal – but I also like sewing stuff I get to wear more than once or twice, and with two littles, I don’t get to sew for me as much as I’d like. Having said that, I do try to sew for my current body. Much as I’d like to be a size down (I have a 5 and 2.5 year old, and I’m a size up since they’ve come), the nice thing about sewing is that there are no tags, only fit. My life doesn’t require formals–though I wish I had the occasional occasion. I sew for the life and body I have now. I didn’t always used to be so realistic, but Me Made May made me see the error of fantasy sewing. Yes, sewing is brutal because it makes aware of every centimeter you put on, and where on your body you’ve put it on. In RTW, with all the sizing inconsistency, you could blame in on the brand, at least to a certain extent (e.g. an Italian 38 is a German 34). But Renee, you still look smashing and I love your hair. Now to your questions: I don’t really sew formal. And I like to sew for the body I have, which also means that wanting to lose weight is a mojo killer to me, because it means that whatever I sew, I won’t be wearing too long if I succeed, or if I do, it means that I failed. Oh, you delightful young woman! Here’s the ugly truth about growing older, that you probably won’t believe even if any old woman were mean enough to tell you: you WILL become a shape-shifter. Even if your weight stays just the same, your shape will change. Gravity and time and normal aging processes make your vertebrae gradually collapse onto themselves. This means that there is not as much room between your clavicle and your pelvis as when you were young — but you still have the same amount of internal organs and skin! You’ll pooch out more in front. Your bosom will naturally fall downward, even if your breasts are still relatively perky. Fluctuations in digestion might mean that your waist changes size throughout the day: waistbands that are very loose in the morning might be painfully tight by the afternoon. This is why elastic waistbands are an old woman’s friend! (Well, that, and the convenience factor if you suffer incontinence.) “Sewing for the body you have” is trickier when the body you have changes hourly throughout the day. Oh dear, I seem to have become that mean old woman who tells you about getting older. Sorry about that. The good news is that your friends and loved ones will adore you no matter what you look like. And worsening eyesight is not necessarily a curse. I definitely have a few clothes that no longer fit too well but if as I get back to my previous workout schedule, I know that they will fit more comfortably. In any case, I sew my dresses for weddings and things. Fortunately not have been super formal – more like cocktail attire/Nigerian inspired formal, so I’ve been able to get more wear out of the clothes. My daughter wears quite a few formals and she always uses RenttheRunway.com. Expensive designer dresses for a fraction of the cost. You can choose a dress and they will send your size and then a back-up size just in case you’re unsure which will work. You can also get a second style sent as well (but not a back-up size for that one). For one event, she wore a $3,000 dress for around $100. When the event is over, ship it back for free in their packaging. Extremely easy and well worth it to not have to shop at the mall, etc.! And btw you both look so awesome! Love your smiles! The muslin looks great; you’ve really nailed the fit. ‘I’ve seen you really learn how to fit over the years, from the days when you didn’t make fbas to this very nice bodice. Sew for the body you have or you will never have anything to wear! You can always alter it later since it’s not as if you gone up all that much. I’d make my dress for a formal just because I really can’t afford what I like. I want sleeves and that’s not all that easy to come by these days either. I absolutely sew for the body I have now. I would love to lose about 30lbs, but I’m so happy with where I am at in my life that I don’t stress over it. I’m with you – I would rather be comfortable and confident in what I’m wearing than feeling uncomfortable and restricted and put the unfair pressure on myself to make my body fit into something just based on a past set of measurements. And one thing I’ve learned from experience – even when I have lost enough weight to fit into something that “used to fit,” it doesn’t always fit the same way due to the different ways that our weight distributes when we gain/lose as we get older. I’m trying to sew for the body I have now, though I’ll admit that it’s tricky and I always cringe a little when I see the size numbers other people sew vs the ones I have to sew…but then I remind myself that I have a 4 month old baby–my body still isn’t back to being just mine. As for formal wear, I never have an occasion to wear the stuff. But if I did, I likely wouldn’t have enough advance warning to sew something should I want to. And I still wouldn’t want to sew it, because I prefer to sew (boring) things that I’ll actually wear often vs things that I might wear once, maaayyyyyyybe twice. Plus, I hate fussy sewing. I think that’s why quilting isn’t my favorite–so many little pieces that are fussy to cut, fussy to sew, and then you get a big ‘ol swath of fabric that’s fussy to get under your machine to quilt. I haven’t had a formal occasion come up since I began to seriously sew for myself so I think I would maybe sew the first one that comes along, just for the experience of it, but I would choose something classic and timeless in hopes of wearing it again. All these fishies! LOL. Never sew for the wannabe body – what if you’re hit by a truck before it fits? A woman’s body deserves beautiful, well-fitting clothes every day, not just when one is 30 lbs lighter or whatever. Re making everything – as a knitter, I see lots of cute crafty things but always remind myself, “Just because you CAN, doesn’t mean you SHOULD.” Same for formalwear, suits, whatever. No need to stress about anything, just buy whatever and smile and accept compliments. As far as formals, I sew my gown for almost all the ones I go to. But since I only go to one per year usually, it works out. If I had more, I’d probably look into purchasing. I,too,sew for the size I am. I won’t spend time sewing a garment I can’t wear the minute it’s finished. 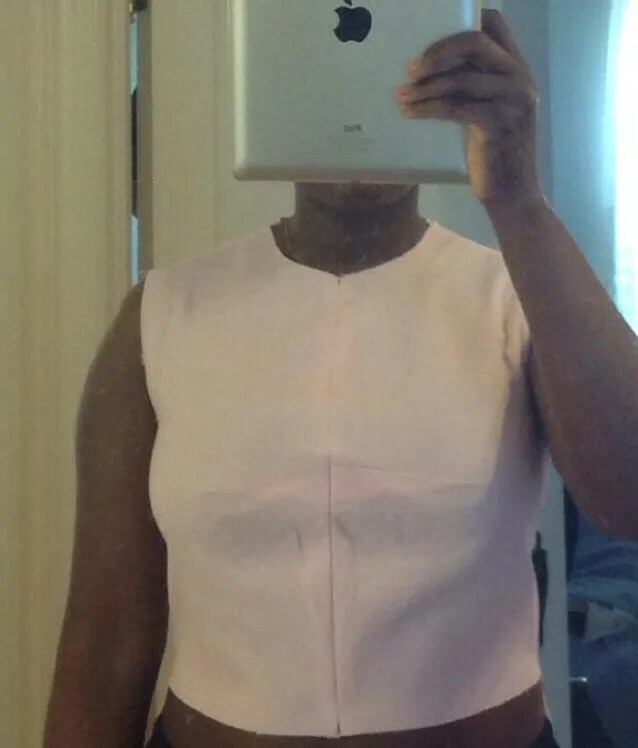 I also sew all formal garments because I’m difficult to fit but I always use a TNT pattern to ease the stress and to feel confident the expensive fabric will turn into a success.